At the top of the Himalayas, yeti Migo (voiced by Channing Tatum) is unbelievably excited. Their community’s leader the Stonekeeper (Common) has officially given him permission to start training to take over for his loving father Dorgle (Danny DeVito) ringing the giant gong every morning that signals the dawn of a new day. After an accidental mishap during his first practice session, the young, gregarious yeti finds himself out in the wintry desolate wilds outside of town. While there, he sees a strange flying machine crash into the side of the mountain, an odd two-legged creature with incredibly small feet floating to safety carried by the wind. According to the Stonekeeper, the most valued member of the yeti society who protects the various laws that help govern the clan’s day-to-day actions, these creatures, nicknamed “Smallfoot,” aren’t supposed to exist. But when Migo insists he saw one he’s summarily stripped of his duties and exiled outside the village until he admits he was in error. However, the inquisitive and outgoing Meechee (Zendaya), the Stonekeeper’s daughter, believes him when he says he saw a Smallfoot. In fact, she thinks Migo should break the rules that their community lives by and descend down the side of the mountain into the unknown below in order to see if he can find where that Smallfoot happened to disappear to. Based on the book Yeti Tracks by Sergio Pablos, the animated family comedy Smallfoot is a middling effort that never lives up to its potential. While the majority of the voice casts acquits themselves admirably, Tatum, Zendaya, DeVito, LeBron James (yes, that Lebron James) and Common in particular, and even though there are a couple of strong musical moments that brought a smile to my face, overall this is a blandly forgettable affair only the youngest members of the audience are likely to find captivating. Director Karey Kirkpatrick is sadly a long way from the imaginative cornball goofiness of Over the Hedge, and no matter how much promise this scenario might possess the film version born from Pablos’ source material sadly delivers on precious little of it. The human portions of the story are by far this adaptation’s most obnoxiously underwhelming elements. 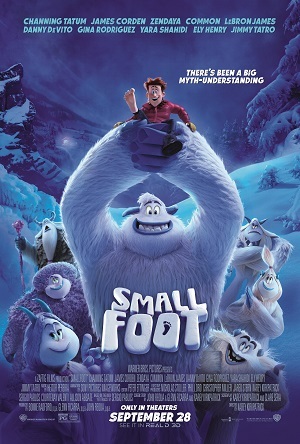 When yeti talk about “Smallfoot” they are unknowingly talking about people, and it is the developing relationship between Migo and one particular person, Percy (James Corden), a downtrodden television personality known whose long-running nature program is on the verge of cancelation that forms the foundation upon which the majority of the movie’s narrative is built upon. Problem is, their blossoming friendship isn’t interesting. If anything, it often feels like nothing more than a complete waste of time. Percy is an insufferable blowhard whose eventual redemption is hackneyed, forced and not even moderately believable. It just doesn’t work, and considering the core of the story revolves around the two of them this is something of a significant issue. Don’t get me wrong. There are a number of nice little moments, including a rather powerful musical number where the Stonekeeper lets Migo in on a massive secret it’s been his and his predecessors’ job to protect for countless generations. The opening montage introducing yeti civilization is also rather winning, the whole sequence achieving a Dr. Seuss meets Looney Tunes exuberance that had me grinning like a six-year-old standing in the middle of a candy store. Kirkpatrick and his co-director Jason Reisig stage these and other scenes with a goofy bravado that’s undeniably appealing, and if the movie would just have shown a bit more flair and spent more time developing its characters there might have been something winning here we could be talking about. But the script gets more and more tiresome as it goes along, and Percy is as annoying a secondary protagonist as any I’ve had the unfortunate displeasure to come into contact with in quite some time. The last third of the movie is a giant mess that’s incoherent to the point that it becomes obnoxiously aggravating, and it almost feels at time as if Kirkpatrick through the script out altogether and just let his animators do whatever the heck they wanted no matter what the consequences. I just didn’t enjoy myself, and while I didn’t exactly hate sitting in the theatre watching events play out to their conclusion that doesn’t mean I didn’t want to throw snowballs at the screen while I did so. Not that little kids will care. Smallfoot is just pleasing enough younger viewers will likely have a grand time watching Migo and his fellow yeti’s juvenile antics. While I didn’t like the movie, that doesn’t mean I can’t admit I’m not exactly in the prime age group it’s been designed to entertain. Kirkpatrick and his team should have kept adults in mind, of course, as they attempted to give their story life, and I’m not about to let them off the hook for not doing so. But I won’t get angry if parents decide to grab the DVD or Blu-ray for their family library when the movie becomes available sometime around the start of next year, this frosty animated effort not so much abominable as it is boringly ho-hum.